ClearPath has partnered with Kay Coughlin, CEO and Chief Facilitator of Facilitator On Fire, who is an expert in team productivity and overcoming team roadblocks. She is on a mission to help Millennials, Gen X-ers and Boomers (and Zs and Traditionalists, too!) work together on teams that are higher-performing and happier. We hope you will find her article informative and helpful. I have some bad news: when you say the word, “fine,” it doesn’t mean what you think it does. You don’t even have to do anything special to claim these for your team immediately. When you are tempted to say “fine,” you simply say a more descriptive word instead. That’s the whole assignment. I know it seems difficult, but you can do it. I know because I help teams get beyond “fine” every day. And I can help you too. In fact, you can choose to have meetings that are better than fine right now. Download our Cheat Sheet to Disrupt Damaging Meeting Behaviors. Join the Great Teams on Purpose Mastermind, led by Kay Coughlin, CEO, Facilitator On Fire. Begins Tuesday, April 9, 2019, with a full-day workshop. You can opt to lead teams that attract success. Teams that shift in the direction of greatness instead of resisting it. It is possible, and well within your reach. And here is some good news: we can help you make an incredible commitment to yourself and your team by choosing to upgrade your team leadership skills! Kay Coughlin, “Great Teams on Purpose Mastermind,” helps leaders and managers build amazing multi-generational teams (register here). The skill she teaches in her public speaking, “How to be Heard in a Noisy Business World,” is part of the formula she created to help teams become abundantly successful, together. 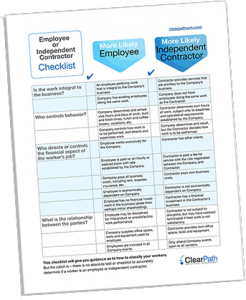 For all other questions about assessing your workforce or conducting a review of your current hiring processes, the ClearPath team can assist you.